Born in Cardiff Road, Simon’s Town in 1929, as the third born child in a family of six, there was much that his domestic worker mother and Dockyard handyman father could not give him. But what they did give him he values greatly. They were the right parents for me, because although they did not have a wonderful education, they were balanced people in that they wanted their children to choose the right paths. They were both interested in reading and I always tell people that my parents read, and when your parents read you can’t help being curious about this”. By the time he was four the family moved to a two bedroomed cottage in Wesley Street and it was from here that Peter would walk to the Boys Mission School which he attended until moving on to Arsenal Road School in Standard 3. A free spirited boy by nature, Peter suffered the institutionalisation of school life very badly. He battled to conform to the regimental thinking and behaviour that was expected of him and was happiest going off into his own world where he could be true to himself and draw the pictures that he saw in his head. Peter’s parents, though poor, recognised that this boy was a deep thinker and though their income was meagre, always tried to support him by supplying him with a regular supply of pencils, crayons and paper on which to practise his art. As the years went by Peter felt more and more stifled by school and after a year spent at Livingston High School he told his parents that he no longer wanted to go to school. I fell in love with freedom early in my life and when I saw what looked to me like institutional regulations, I could not take it. His parents, though disappointed, decided that if he did not want to go to school he would then need to go to work and Peter became employed at the Dockyard, as a boat cleaner and painter. When the ships came in we would go and clean the ships in Dry Dock and then we would paint the ships. I was 15 years old. A laatjie. This was during the war-time, in 1944. After the war he found himself unemployed for two weeks and then the Navy re-employed him in the Works Dept at the Dockyard. While doing “all sorts of shore jobs” by day, Peter sat up and painted until late at night and in 1947, attended evening art classes at Saint Philips School in Cape Town. It was during this period that he painted the very beautiful watercolour: “Towards Simon’s Town from St James”. 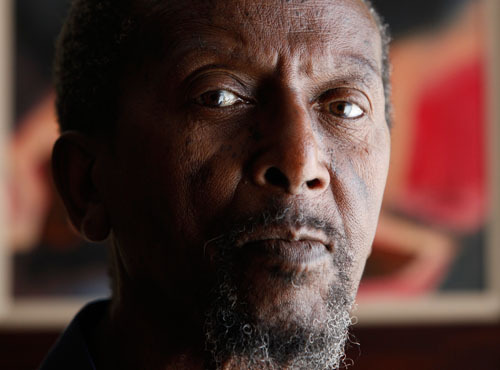 A comment by his domestic worker sister to her “madam” about her brother who ‘likes to paint’, led to him being brought to the attention of Dean Anderson, the head of the architectural school at UCT. He bought some of Peter’s work and word of this talented young man from Simon’s Town started to spread. Mathys Bokhorst, the Director of the National Gallery, came to know about him and thus in 1951 Peter took part in a group exhibition at the Association of Arts Gallery in Cape Town for the first time. By this time the Clarke family had moved from Wesley Street to the Waterfall Flats in Waterfall Road, where a steady stream of visitors came to view his work. An offer by Maskew Miller to do book illustrations soon followed. While painting was his first love, Peter also enjoyed creative writing and in 1955 Peter won first prize in a short story competition. The prize money of fifty pounds he happily spent on art materials. In 1956 Peter felt the need to take time out where he could paint quietly and undisturbed for a few months at a time. A friend arranged for him to spend three months at his family home in Tesserlaarsdal, a little village in Caledon, where his friend’s father lived alone. It was at this time that Peter gave up his day-time job at the Dockyard and from then on for several years Peter would go to Tesserlaarsdal to paint from September to December of every year. The solitude and serenity at Tesserlaarsdal gave him the freedom to produce many beautiful pieces of art and culminated in his first solo exhibition in 1957. This was held at the Golden City Post. His life as a full time artist and writer had begun. By 1961 Peter’s art was being showcased at exhibitions in England, Germany and the USA and in 1962 he was invited to study printmaking in Holland. A few years later he went to Norway where he studied etching. He also continued to write and one of his stories “Eleven O’Clock: The Wagons, the Shore” was read on BBC radio in England. In 1966, a year after receiving the C P Hoogenhout Book Illustration Award, Peter’s personal world became unsettled by newspaper reports that Simon’s Town had become an ‘affected area’ under the Group Areas Act. But it was only when an official came knocking on the door that reality sunk in. The loneliness that he felt at this time is movingly encapsulated in his oil painting ‘The Lonely Wanderer’, which depicts a man walking all alone in a barren street, where no smoke drifts from the solitary chimney and the barren windows all stare out like the vacant eyes of the dead. Even the clouds are dark and grey, giving warning of a storm. Is this the storm he felt in his heart? In time we moved. We had to organise our own transport and a friend of mine, who happened to be Jewish and who had a business, said ‘alright I will arrange transport for you, I’ve got a big truck’. And he arranged for his truck and his workers to come and give us a hand and this in the heart of winter and soup had been organised by my mother so that she could give all the helpers soup and bread and we moved off to Ocean View. In 1975 he was invited to take part in an International Writer’s programme at the University of Iowa, USA, where he spent 9 months. While he did a good deal of poetry during his stay, it was in his art that the sense of prevailing loss he felt was so clearly evident. From the triptych “Haunted landscape” the anguish and desolation felt not only by himself, but by all the people affected by the Forced Removals is so clearly evident. The depiction of the once peaceful doves fighting proved all too prophetic a year later when thousands of school children took up the fight against Apartheid, many losing their lives in the process. When I came back it could have been about May. I was actually struck by how peaceful and prosperous Cape Town looked because there was a lot of building going on and I still commented on all this activity going on, buildings going up and everybody employed and then suddenly it all exploded and the change of course …..
Actually I think that this is a ghetto, but the nice thing about this ghetto is that it has mountains and there is a sea not too far away and the air is always fresh. It’s nice to see these adults now who had not been crippled by tik. I would not like to go back to Simon’s Town because you can’t go back to the past. The thing about going back to the past is that all those elements that made up your life, the neighbours, the people you knew, the smells of supper coming from different houses, the sounds of voices of people living around and so on, all those familiar things are not there any longer. I would like to be able to ask people living in Simon’s Town, are you happy living here, but in so many cases they are strangers and in so many cases there are houses that appear to be empty, you go into neighbourhoods, you don’t see people, no children playing and sometimes a dog barking. It is the same, but it is not the same.